The Dog Days of Summer are here again and Toronto residents are enjoying the long days and hot sunny weather with their canine companions in tow. But when mother nature has turned up the heat, the great outdoors can start to feel uncomfortable quickly. Humans can efficiently cool their bodies by sweating. Dogs, on the other hand, do not have this ability. Their lack of sweat glands means dogs are highly susceptible to heatstroke – a dangerous and potentially fatal condition. A dog’s main method of cooling involves panting – where they rapidly and repeatedly exhale the warm air from their lungs and inhale the cooler outside air. When the outside air is very hot and humid, dogs cannot efficiently cool themselves. This is particularly problematic when they are active outdoors because they are producing more internal heat without the ability to dispel it. As a result their body temperature rises. Dogs can handle a temporary and mild increase in body temperature. More pronounced and prolonged increases, however, can lead to damage to multiple organs, including the kidneys, liver, intestines, and brain. If temperature elevation is severe and prolonged, this condition becomes fatal. Certain dogs are at a higher risk for development of heatstroke. These include brachycephalic breeds (short nosed dogs like Bulldogs, Pugs, or Boston Terriers), dogs with thick coats, and dogs that are overweight or active. It is important to recognize the early signs that your dog is becoming overheated. 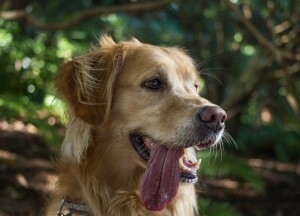 You may see your dog panting harder than normal, the tongue may appear bright red, and your normally active dog may slow down and seem disoriented or confused. If these signs appear, it is important to cool your dog down as soon as possible. Caught early, the effects of heatstroke are reversible with cooling. If this condition has progressed, you may see incoordination, seizures, pale gums, vomiting or diarrhea with blood, or unconsciousness. If any of these signs appear or your dog fails to improve with cooling techniques alone, this indicates an absolute medical emergency, and will require immediate treatment at a veterinary hospital. You can help your dog beat the heat by finding a shady area, wetting the ears and paws, and covering the body with wet towels. Direct a fan towards your dog if possible. Offer cool fresh water to drink and stop all physical activity. Do not use very cold or ice water to cool your dog as this will cause the blood vessels at the skin to contract and reduce the heat loss. It may also cause your dog to shiver which can increase body temperature. When walking in warmer weather, you can help your dog stay cool by placing a wet shirt or bandana on your dog. You may also use a cooling vest, found online or at some pet stores. These vests are made of a special material that holds on to water and helps cool your dog by evaporation. Be sure to always bring fresh drinking water with you for your dog. The best way to minimize your dog’s risk of heatstroke is to avoid situations that can lead to overheating. Choose cooler times of the day to walk your dog, like first thing in the morning or in the evening after the sun goes down. When it is hot outside, keep walks short and slow. If your dog is left outside during the day, make sure there is a shady area accessible and provide fresh cool water at all times. You could even provide a small pool of water your dog can use to soak the paws and body. If you need to leave your dog indoors on a hot day and you do not have air conditioning, leave a fan on for your dog. We hope you and your pooch enjoy a long, warm summer with lots of sun. Just remember to stay cool and stay safe!